1. Click on File Manager in the side navigation. 2. Click on Files & Folders. 3. Navigate to the folder you would like to edit permissions for and click the icon. 4. 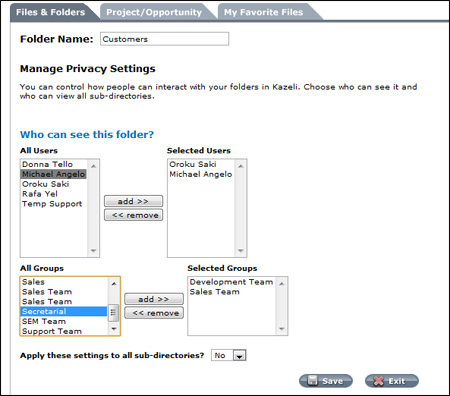 To add individual users or User Groups, select the user or group and click Add. They will then appear in the Selected Users and Selected Groups lists. To remove a user or group, select and click Remove. 5. To apply the same permission settings to all folders within the folder you are currently editing, select Yesbeside the ‘Apply these settings to all sub-directories?’ option.